15/07/11 -- Soybeans: Aug 11 soybeans closed at USD13.85 3/4, up 3 3/4 cents; Nov 11 soybeans closed at USD13.87, up 3 cents; Aug 11 soybean meal closed at USD360.30, up USD3.30; Aug 11 soybean oil closed at 57.35, up 4 points. Aug beans were up 40 3/4 cents on the week. A heatwave is expected for much of the US this weekend, encouraging some risk premium being added to the market even though the crop is still a few weeks away from its critical yield development stage in August. Some forecasts are calling for mostly hot and dry for much of the Midwest for the next fortnight, although others see the chance of a break in the weather a week from now. Corn: Sep 11 corn closed at USD7.01 1/4, up 10 1/2 cents; Dec 11 corn closed at USD6.85, up 6 1/2 cents. Dec corn was up 68 1/2 cents on the week. As with soybeans the corn market was adding some pre-weekend risk premium on fears that a prolonged heatwave would damage corn at the pollination stage, the most sensitive period for determining yields. Strong crude oil and a weaker US dollar also added some support. The dollar was under pressure on talk that Moody's and S&P might downgrade America's credit rating. Wheat: Sep 11 CBOT wheat closed at USD6.94 3/4, down 12 1/4 cents; Sep 11 KCBT wheat closed at USD7.64 1/2, down 3/4 cent; Sep 11 MGEX wheat closed at USD8.23 3/4, down 5 1/4 cents. On the week overall Sep CBOT wheat closed up 43 1/2 cents, Sep 11 KCBT wheat closed up 37 1/4 cents and Sep 11 MGEX wheat closed up 6 3/4 cents. News that Russia had again bought wheat from Russia at far cheaper levels than other origins depressed the market today. US wheat was around USD35/tonne dearer than the winning Russian bids on an FOB basis, and in the case of Egypt there is then dearer freight to add on top. 15/07/11 -- EU grains finished mixed with Nov London wheat down GBP1.15 at GBP165.00/tonne and with May falling GBP1.65/tonne to GBP171.50/tonne. 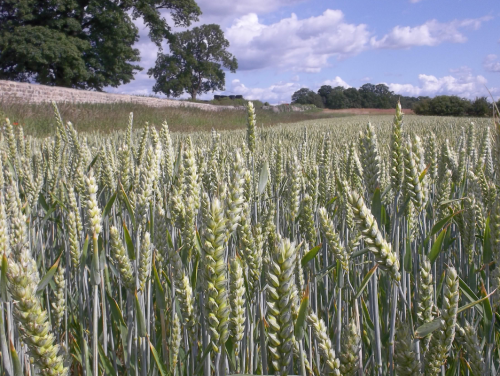 Nov Paris wheat rose EUR2.25/tonne to EUR200.00/tonne whilst May12 climbed EUR1.25/tonne to EUR204.00/tonne. On the week as overall Nov London wheat was just GBP0.25/tonne higher, with Nov Paris wheat adding EUR4.75/tonne. The continuing decline of the euro being responsible for French gains relative to London's token increase. 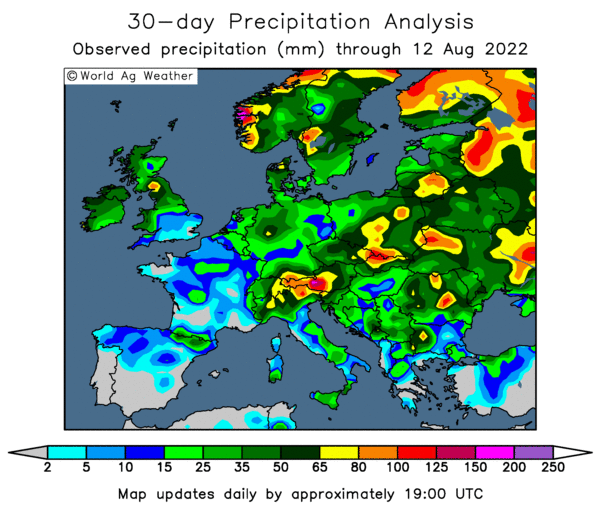 The recent arrival of rains across much of Europe may have come just in time for wheat, according to Strategie Grains. They've increased their EU soft wheat production estimate by 4.6 MMT from last month to 130.2 MMT. All wheat output is now seen at 138.4 MMT, a 2% increase on last year and a far cry from the doom and gloom scenario that many had feared. The rains could also certainly do wonders for corn production, which Strategie Grains now peg at 60.2 MMT this year. That's an increase of 9.5% on 2010. EU export licences were issued for 249,000 MT of soft wheat this past week, an advance at least on last week's meagre 110,000 MT. Even so wheat imports are now outstripping exports, coming in at 820,000 MT during the past week meaning that we imported more than three times the volume exported. The suspension by Brussels of the import duty on wheat certainly seems to be having a significant impact. 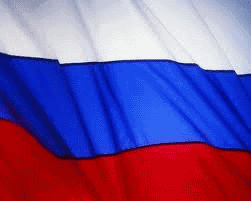 Egypt bought three cargoes of Russian wheat for the second week in a row, passing on offers of US and French wheat. The winning bids came in at around USD245-247/tonne, whilst the cheapest French bid was USD279/tonne. Clearly money talks, any thoughts of Russia's reliability as a supplier goes out of the window when each 60,000 MT cargo is roughly USD2 million cheaper than the French option. 14/07/11 -- EU grains finished with Nov London wheat GBP1.00/tonne lower at GBP166.15/tonne and Nov Paris wheat EUR3.25/tonne easier at EUR197.75/tonne in a modest correction from yeaterday's gains. Black Sea wheat keeps winning all the major tenders around at the moment, so any sharp price rises in the EU will only serve to alienate EU wheat on the export front even further. We may have a reminder of just how much cheaper wheat from Russia has become since the opening if their export window when Egypt tender for wheat again tomorrow. Trade gossip suggests that last season's wheat crop estimate in Russia was significantly understated, which would explain how they finished up with good carryover stocks despite suffering the worst drought im 100 years. SovEcon peg this year's grain crop in Russia at a median of 89.5 MMT, 47% up on last year. 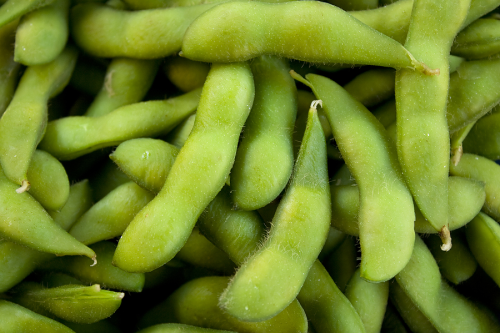 13/07/11 -- Soybeans: Jul 11 Soybeans closed at USD13.87, up 20 1/2 cents, Nov 11 Soybeans closed at USD13.79 3/4, up 21 1/2 cents; Jul 11 Soybean Meal closed at USD353.20, up USD4.70; Jul 11 Soybean Oil closed at 57.45, up 115 points. Corn: Jul 11 Corn closed at USD7.26 3/4, up 29 3/4 cents; Dec 11 Corn closed at USD6.79 3/4, up 21 3/4 cents. Wheat: Jul 11 CBOT Wheat closed at USD7.02, up 39 1/4 cents; Jul 11 KCBT Wheat closed at USD7.41, up 27 1/4 cents; Jul 11 MGEX Wheat closed at USD8.21 1/4, up 9 3/4 cents. We've got our first proper US weather market of the year for beans and corn, with a "heat dome" set to establish itself over the Midwest. The National Weather Service is forecasting much above normal temperatures for most of the country for the next fortnight. Funds bought an estimated 20,000 corn contracts on the day, and estimates for tomorrow’s weekly corn export sales report are expected to be large at 1.5 to 2 thousand MT. An announcement by Fed Ben Bernanke that further economic stimulus is under consideration gave a boost to commodities in general. 13/07/11 -- Nov London wheat was sharply higher, up GBP5.55/tonne to GBP167.15/tonne with Nov Paris wheat up EUR9.75/tonne to EUR201.00/tonne. 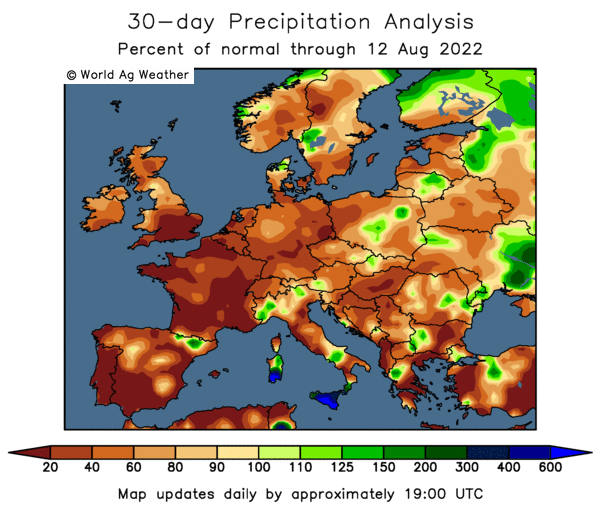 A heat wave in the US sent EU grain prices soaring. Late planted corn is expected to suffer as a heat dome forms over the central Plains and Mississippi Delta. Bulls were quick to point out that corn yields declined sharply last year from their June estimate of 163.5 bu/acre before a hot and dry July and August cut that back to a final yield of 152.8 bu/acre. 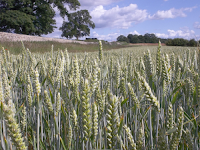 Agritel are forecasting a French soft wheat crop of 31.7 MMT, an 11.5% reduction on last year. Recent concerns over commodity demand from China was eased after they unveiled second-quarter economic growth of 9.5%. The Philippines bought 75,000 MT of Black Sea feed wheat at levels far cheaper than EU, US or Australian wheat. That underlines recent news that Egypt bought Russian milling wheat at USD30-40/tonne cheaper than EU origin. Are all male flight attendants gay? Even the way they wheel their little bags about looks gay. Don't get me wrong I have nothing against gays. Some of my best friends are gay, like erm...well I can't think of one right now but I'm sure I must have some gay chums. 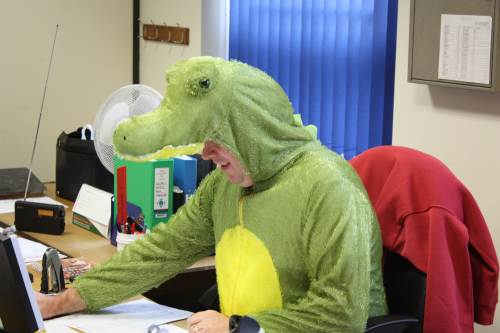 The ones who work for Cargill maybe? 12/07/11 -- Soybeans: Jul 11 soybeans closed at USD13.66 1/2, up 14 cents; Nov 11sSoybeans closed at USD13.58 1/4, up 11 1/4 cents; Jul 11 soybean meal closed at USD348.50, up USD2.50; Jul 11 soybean oil closed at 56.30, up 10 points. The USDA report was neutral for beans with old crop ending stocks raised and new crop ending stocks lowered. World ending stocks for 2010/11 were pegged at the largest on record, but spillover strength from corn added strength to beans. The bulls are getting excited about a hot and dry spell in store for much of the Midwest in the week ahead. Corn: Jul 11 corn closed at USD6.97, up 15 1/2 cents; Sep 11 corn closed at USD6.64, up 21 cents; Dec 11 corn closed at USD6.58, up 25 1/4 cents. The USDA increased ending stocks but not by as much as had been anticipated, prompting funds to come in for an estimated 20,000 contracts on the day. Private exporters announced the sale of 233,000 MT of new crop corn to unknown and 110,000 MT to South Korea. Wheat: Jul 11 CBOT wheat closed at USD6.62 3/4, up 26 3/4 cents; Jul 11 KCBTwWheat closed at USD7.13 3/4, up 21 3/4 cents; Jul 11 MGEX wheat closed at USD8.11 1/2, down 3 cents. US all wheat production was raised to 2.106 billion from 2.058 billion last month. World production and ending stocks were reduced by around 2 MMT by the USDA, largely on the back of reduced Canadian output. 12/07/11 -- Nov London wheat fell GBP1.00/tonne to GBP161.50/tonne and May12 declined GBP0.85/tonne to GBP168.15/tonne. Nov Paris wheat was EUR0.50 higher whilst May12 fell 0.50/tonne to EUR196.00/tonne. Concerns about European debt were partially offset by a mildly friendly USDA report. Talk of an imminent Greek debt default and some bigger player such as Spain and Italy getting rapidly sucked into the vortex had the euro on the back foot, and investors giving commodities a wide berth. The USDA did a little to help, cutting world wheat production, and consequently world ending stocks by around 2 MMT for the season ahead. Even so 2011/12 stocks/usage is still a comfortable 27%. Canada's crop was reduced from an estimated 25 MMT last month to 21.5 MMT this time round, and her export potential cut from 18.5 MMT to 16 MMT on the back of it. EU-27 wheat output was raised from 131.5 MMT to 132.12 MMT, with exports left steady at 15 MMT. 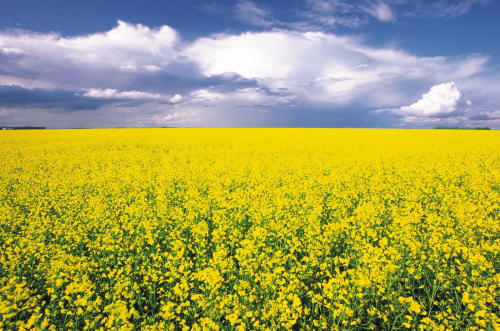 As far as the Black Sea is concerned Russian and Kazakh production estimates were left unchanged, but Ukraine's crop was downsized from 19 MMT to 18 MMT and exports there cut by a corresponding 1 MMT to 7.5 MMT. Russia's export potential was however raised by 2 MMT to 12 MMT. Elsewhere the French farm office, FranceAgriMer, upped their soft wheat production estimate from 31 MMT to 32 MMT reflecting drought losses being not as bad as had been feared. 12/07/11 -- Blogging activity will be fairly light for the rest of the week as I'm heading to Kiev for a conference in the style of the jet-setting, man-about-town, high profile grain blogger that I am. 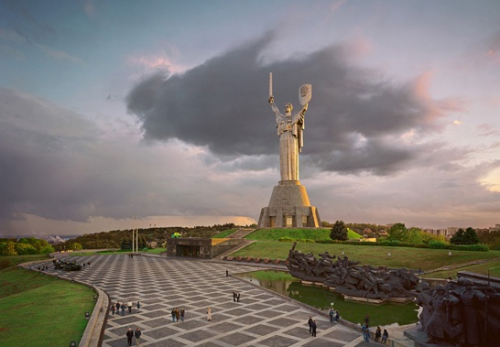 This magnificent statue called "Mother Motherland" (it must have lost something in translation there) stands 62 m tall on top of the museum building. No, it's not a dustpan and brush she's holding it's a sword and a shield you muppet. 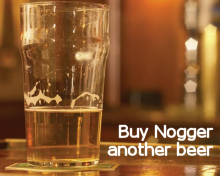 The "buy Nogger a beer" fund has been duly emptied and converted into hryvnias, which is apparently what they call folding beer tokens over there. I'll be doing lots of crop inspecting whilst I'm there. Or at the very least talking to people who have done lots of crop inspecting on my behalf whilst having a beer or two, which I will report back on next week. I wonder if Greece will be in default by then? 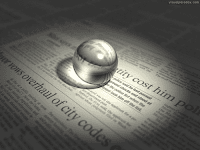 12/07/11 -- The overnight Globex market is lower across the board ahead of this afternoon's USDA WASDE and stocks numbers. After the end of June surprise nobody seems to fancy going into this report too long, or with any huge degree of confidence. There are still plenty of raging bulls out there, incredulous that the market appears to have turned against them despite a plethora of bullish news. China is buying US corn, the USDA numbers are clearly pie-in-the-sky, old crop stocks are extremely tight, it's been too wet, now it's turning too dry, there's a heat wave coming and corn won't pollinate in these temperatures. Yet the market is coming down. Why? Because the funds are selling. Whatever the reason, European debt, Chinese inflation, bigger FSU crops, the funds have decided to dump a hefty portion of their corn longs and the market can't absorb the volume on offer and hold it's head above USD7/bushel. The inability of Europe's finance ministers yesterday to agree a deal on Greece has the market abuzz this morning with talk of an imminent default, be it selective or otherwise. George Soros is now quoted as saying that it may be inevitable. It certainly looks that way. We are around ten seconds after the start of the Grand National here. Lowly outsider Greece is pulling like a train heading for the first fence at 100pmh with Ireland and Portugal tearing after it and with the heavyweights of Spain and Italy just off the leaders. One slip by Greece and this could get very messy. What the weather is doing in America isn't going to make any difference to this lot is it? A bit like the pile-up caused when sub-prime fell at Bechers back in 2008. Corn led the entire market higher and now it seems like it's taking it lower, for reasons that have little to do with corn fundamentals, it's the FUND-amentals that are holding the reigns. 11/07/11 -- Soybeans: Jul 11 soybeans closed at USD13.52 1/2, up 1/2 cent; Nov 11 soybeans closed at USD13.47, up 1/2 cent; Jul 11 soybean meal closed at USD346.00, down USD0.30; Jul 11 soybean oil closed at 56.20, unchanged. Good/excellent crop conditions were unchanged at 66%. Weekly export inspections were on the low end of expectations at 4.490 million bushels. Analysts have mixed ideas as to whether this week's mostly warm and dry weather forecast for the Midwest is beneficial or detrimental. In tomorrow's USDA stocks report soybean ending stocks are estimated at 193 million bushels, up 13 million from the June forecast. Corn: Jul 11 corn closed at USD6.81 1/2, up 9 1/4 cents; Dec 11 corn closed at USD6.32 3/4, down 4 1/4 cents. Funds sold an estimated 5,000 lots on the day. This afternoon’s Crop Progress report came in unchanged at 69% good/excellent. A sharp increase in corn ending stocks is anticipated in tomorrow's USDA report on the back of the June 30th shock numbers. 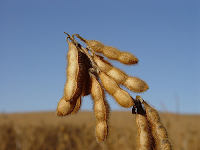 The average analysts guess is 905 million bushels, up from 730 million last month. 2011/12 ending stocks are seen at 994 million versus 900 million last time. Wheat: Jul 11 CBOT wheat closed at USD6.36, down 14 1/2 cents; Jul 11 KCBT weat closed at USD2, down 15 3/4 cents; Jul 11 MGEX wheat closed at USD4 1/2, down 35 1/2 cents. This afternoons Crop Progress report showed Winter Wheat harvested at 63%. Spring wheat conditions were at 73% good/excellent, up 3 points from last week. 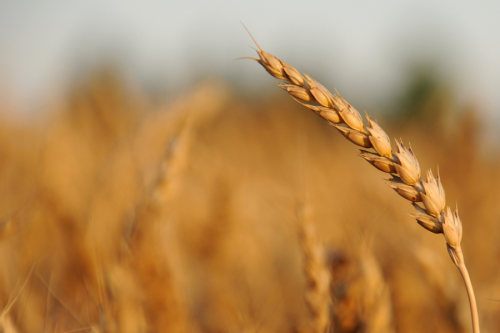 The firm dollar is seen weighing on demand for US wheat which has lost out on three high profile tenders from the Middle East/North Africa last week. In tomorrow's USDA report US all wheat production is seen marginally higher at 2.069 billion bushels. 11/07/11 -- EU grains closed mostly lower with Nov London wheat declining GBP2.25/tonne to GBP162.50/tonne and May 12 down GBP1.00/tonne to GBP169.00/tonne. Nov Paris wheat closed EUR4.00/tonne lower at EUR190.75/tonne whilst May 12 fell EUR3.75/tonne to EUR196.50/tonne. Brighter prospects for Russian/Ukraine production weighed on EU wheat, with SovEcon upping their grain production forecast for the former to 87-92 MMT from 82-86 MMT. Early yields are also better than expected in Ukraine, and recent rains may have boosted spring grains potential further. Winter grain yields so far are up 16% on last season. It's not just the fact that yields and output are seen sharply higher in the FSU, it's the fact that these guys are normally the cheapest sellers in the market with Russia having easily picked up all three of the most significant tenders floating around last week. European debt concerns remain, with the FT suggesting over the weekend that EU ministers may now consider some form of "selective default" by Greece. There are also renewed concerns over Italy getting dragged down into the abyss. 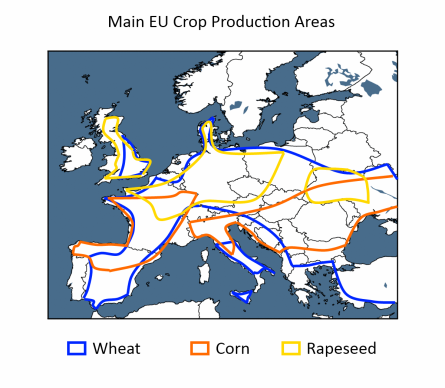 A weak euro and abundant Black Sea grain leaves UK wheat high and dry as far as export homes are concerned. Maybe a reduced harvest in 2011 won't turn out to be as much as a problem after all? 11/07/11 -- The overnight grains began the week lower with beans down around 6-8 cents, wheat 15-18 cents easier and corn mostly 7-9 cents weaker. Crude oil is almost a dollar and a half lower and the USD is steady. Crude is down on renewed global economic concerns. Demand from China where inflation and interest rates keep rising is a worry, as too are European debt concerns. Russia's grain crop is getting larger, and may not be too far off 2009 production levels it now seems. Early yields are better than expected and recent rains have improved spring crop prospects. In Ukraine too the outlook seems to have improved. Having staged an "up week" last week it may be time for traders to take some money off the table ahead of tomorrow's USDA reports. There seems to be some hope amongst the bulls that they will take back what they gave in June as far as corn stocks are concerned. It wouldn't be the first time, but by now we should all know that you can't second guess the USDA. They are just as likely to have a bearish report up their sleeves as a bullish one. The recent hefty outflow of fund money suggests that they don't fancy playing this game for the time being. That may be more significant for prices than anything the USDA have to say tomorrow. A few are trying to get a bullish story going with the US weather with "dryness concerns" and a "developing heat dome" that is featuring in some headlines. Yet only a couple of weeks ago those same participants were moaning about conditions being too cold and wet. A bit of heat isn't going to hurt too much just yet surely. 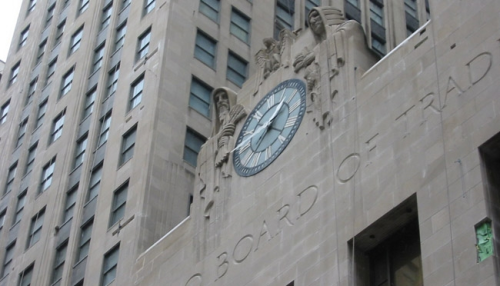 Early calls for this afternoon's CBOT session: beans 6-8c lower, corn down 7-9c and wheat down 15-17c. 11/07/11 -- SovEcon have raised their Russian grain production estimate for this season to 87-92 MMT from 82-86 MMT. Rains in June and early July appear to have boosted production potential although they may also have caused a few quality issues too. In Ukraine they've cut 3.8 MMT of winter grains so far with yields up 16% on last season. 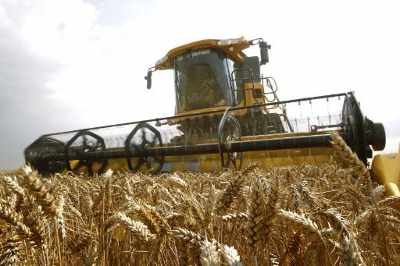 Wheat yields are averaging 3.22 MT/ha with barley yields coming in at 2.79 MT/ha, according to the Ministry. Our man on the ground over there, Mike Lee, reports that recent rains have "really pushed the maize along and many crops are evening up and filling out. Are we about to see a bumper 2011 crop? Tempting to say yes but we still have a long way to go." 11/07/11 -- UK weather, the week ahead from the very interesting Weather Schools Channel on YouTube. Largely dry for much of the UK before rain comes in Saturday/Sunday. 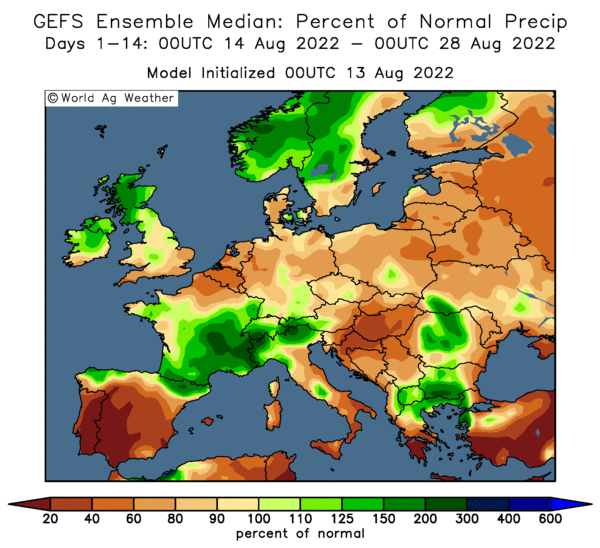 Plenty of the wet stuff however looking set to hit northern France, the low countries and northern/western Germany which could stall the harvest there. 11/07/11 -- The overnight Globex market is trading mostly lower with wheat down around 13-15 cents, and with corn and beans around 4-6 cents easier. Crude oil is more than a dollar weaker and the USD is firmer. News over the weekend that Chinese inflation reached a three year high in June makes another interest rate rise there seem likely. Also causing global economic unease is the slowest car crash in the world, the potential break-up of the euro. A report ion the FT over the weekend apparently said that EU ministers would now consider a "selective default" by Greece. An emergency meeting of top officials dealing with the euro zone debt crisis has been called for today as fears now grow that Italy (the third largest economy in the eurozone) is about to be sucked into the mire. This gigantic house of cards has sub-prime written all over it if you ask me. Unease may continue ahead of the results of stress tests on European banks scheduled for released on Friday. How many toxic debts masquerading as "assets" are these guys holding, and when will the truth emerge? The Bank of Moscow has just been discovered to have toxic debts of USD9 billion hidden within it's books, necessitating the biggest bail-out in Russian history. And that could be just the tip of a very large iceberg. It's not surprising that spec/fund money continues to exit the market. Bloomberg report that "speculators reduced their net-long position in 11 US farm goods by 6.6 percent to 564,174 futures and options contracts in the week ended July 5." That's the lowest in a year, with corn being particularly badly hit for the third straight week. Nov London wheat is down GBP2.75/tonne in early trade, with it's Parisian counterpart falling EUR2.50/tonne.